As a garden designer, I tend to look at the grand gesture. My wonderful art teacher, Ms. Lindaberry, told me that to appreciate a painting I should stand back from it and squint. I do this with gardens. That way I get the bold brush strokes of the composition; the color, the balance, the textures. But of course, the details are important as well. At this time of year some of the sweetest details can be found in little early bulbs. I was introduced to these little gems by an artist of another variety, my friend Sieglinde who is a landscape architect. I’ve always known about the big bold daffodils and tulips, but her enthusiasm for dwarf Narcissus like ‘Hawerra’ and Iris reticulata got me hooked. If not for her, I likely would not have Crocus tommasinianus which is currently blooming in my garden. 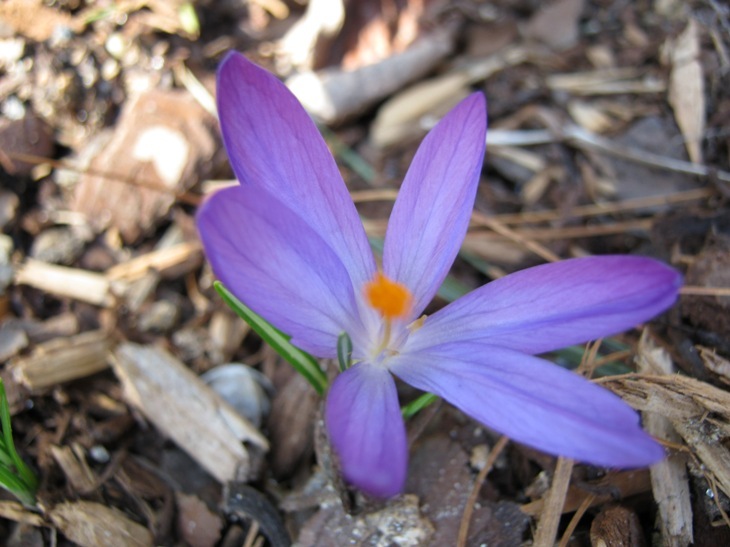 This is one of the earliest Crocus to bloom, is very cold hardy, and less (slightly?) appealing to rodents. The flowers open in the morning and close in the evening and on cloudy days. Average to gritty soil with good drainage is important for success with this little bulb. They are lovely up close and in a big drift that you can squint at. 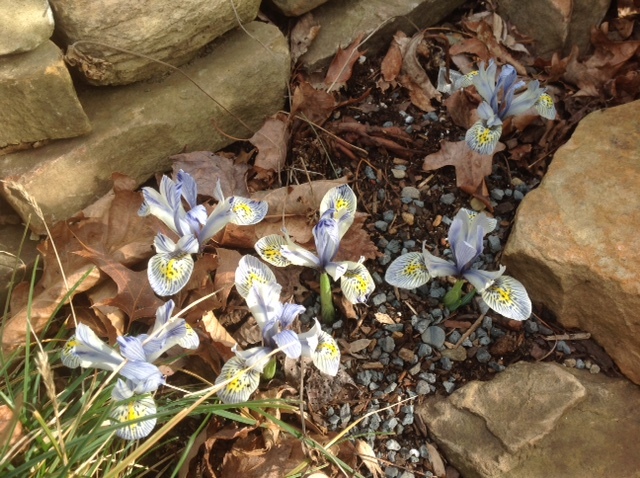 Blooming now in Sieglinde’s garden is Iris ‘Katherine Hodgkin’. It is a bulb, not a rhizome, and is in the Reticulatas class. This is definitely a ‘detail plant’ as it is subtle and complex in its coloring and spreads slowly. Sieglinde gave me a little quantity last fall and I put them in a pot. Hers are up and blooming in the garden; nothing yet from them in the pot. 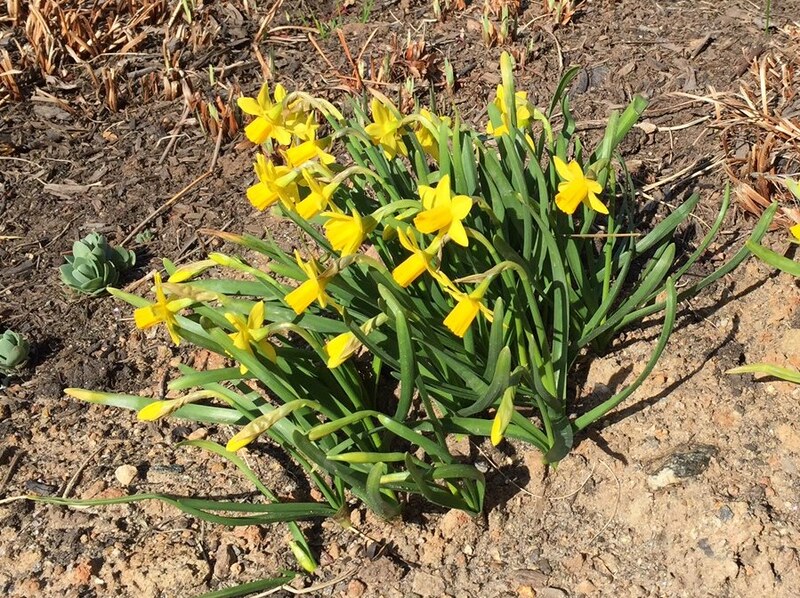 About a week ago, Sieglinde and I walked our dogs at Biltmore and came across this cheerful little daffodil. We’re not certain which one, but best guess is an old heirloom variety; we’ve seen this growing locally near old homesites. One of the best things about these little bulbs is the foliage. It’s short and tends to be grassy looking and fades into the next wave of plants more gracefully than some of the larger bulbs. (Although I wouldn’t be without some of these anyway, even if their browning leaves look ratty just as the garden is ramping up for summer). 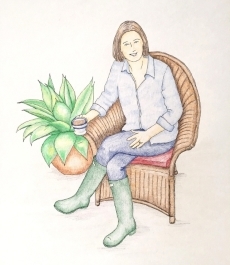 No bulb devotee should be without Bulb by Anna Pavord. This book is beautiful to page through and a terrific reference. I’ve used it for this post. If you planted by her Bulbs by Season lists, you could have bulbs blooming just about all year. 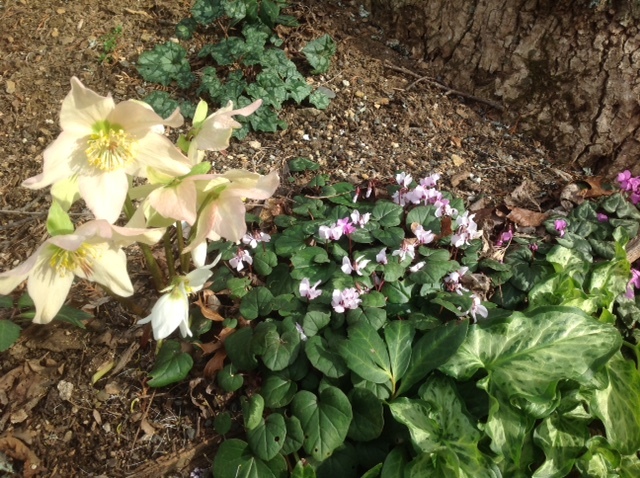 Photo credit to Sieglinde Anderson for Helleborous niger and Iris ‘Katherine Hodgkin’.